We're Planning a Conference! Find more details here. Labour of Love? : Precarious Work and the Future of Academic Workers is an interdisciplinary conference that offers academics and workers from all institutions an opportunity to explore what it means to do precarious work and how to address its challenges. 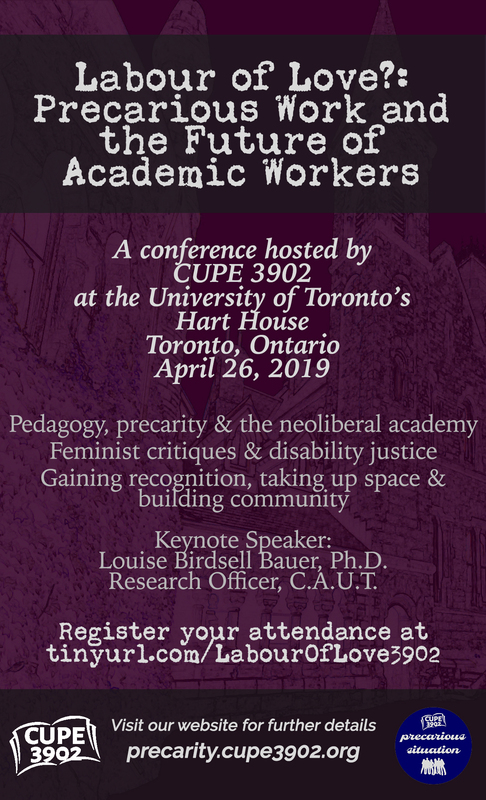 The conference is being organized by the Precarity Working Group, a team of dedicated University of Toronto Unit 3 members who have developed an educational and mobilizing campaign around academic precarious work called Precarious Situation. This group is dedicated to research, mobilization, and member education around the precarious situation of contract academic workers on campus. If you are interested in volunteering on the day of the conference please email Diana Cucuz at diana.cucuz@utoronto.ca. If you are interested in The Precarity Working Group and their Precarious Situation Campaign please email organizer@cupe3902.org for ways to get involved and visit us online at http://precarity.cupe3902.org and @precarioussituation on Instagram.